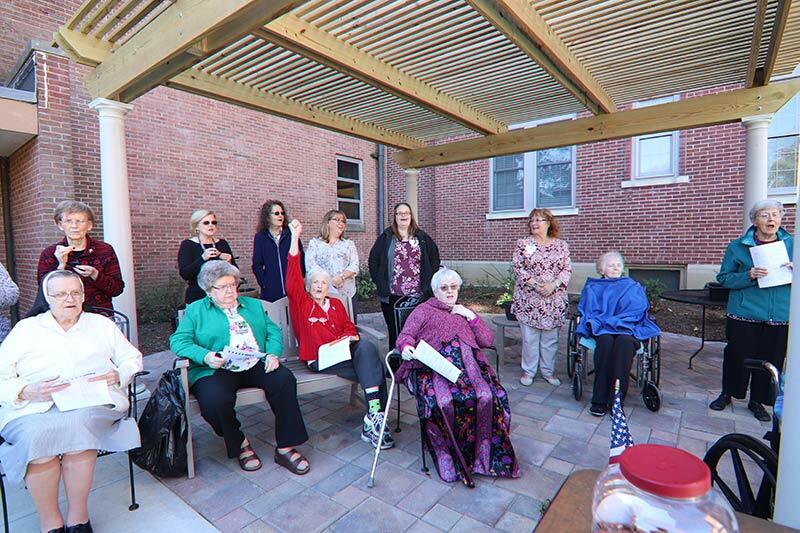 Sisters of Providence and others enjoying a cookout during Foundation Day earlier this year. I have been spending considerable time over the last few weeks trying to update, I might say, a satisfying meaning of the term well-being. This is important to me at this time in my life. Actually, anytime in my life! Beyond the fact that well-being is a key word in the HOPE Mission Statement of our HOME Initiative and beyond the fact that it is the lead descriptor of the work of HOME (Helping Ourselves Meaningfully Engage), I have come to realize over my 69-plus years that well-being is essential for my life. I cannot take it for granted. It will not come by osmosis. It will not come by “chance.” Nor, when realized, can I wrap it up and store it in a safety box and place it on a shelf in my interior closet of life and call it private. The term well-being really came to life for me in 1972, when I worked in cancer nursing and began to hear about hospice care. With colleagues working day-to-day, we talked about the realities in medical and nursing care at that time and shared a common understanding that life for the terminally ill needed to be very different. We described it then as the need to support an environment that fostered well-being! We knew clearly that this would require a huge transformation in the why and how in the care of those expecting to die of a variety of illnesses. We knew that we would be challenged, doubted, marginalized from what was then known as acute care in medical practice. I am glad to say that much has evolved since 1972, as the energy for transformation of health care continued through the past decades and into today. So, here I am. What have I learned? What life experiences have broadened the meaning of well-being for me? First, let me clarify that my identity is much more than the wonderful profession of my nursing career. Yet, I am forever grateful for those persons along the way of the professional work years of my life who assisted, knowing and unknowing, in my life’s journey forward into a deeper realization of well-being. So, today, I realize that well-being is essential for me to claim my true identity and to collaborate with others in an environment that fosters, evolves and co-creates well-being for all creation. Essential is one of those “wow” words! Is this really true? Let me summarize where I am now with the meaning of well-being. Well-being is two words brought together as a way to express life experience. Remember the “woman at the well” in scripture and what happened to her at the well? It was here that she discovered her center of well-being. She connected with her God and God’s mystery of Love. That is the heart of my definition of well-being; deep, soul centered, alive, co-creating source! This approach need not consider if I am in health, in illness, in chronic decline, dying or in recovery or running a marathon! Well is the avenue to what is most important in my identity, uniqueness, created in God’s image and likeness, sacred, presence and always alive in the Divine Mystery. Then comes the word being. Pushed forward by the word well, being is about a desire for harmony. We all seek harmony. This is constant our whole lives. Being is about oneness with creation in silence and in sounds, in touch, smell and sight, in dreams and imagination; human relationships, relationship with music, plants, animals, insects (yes!) on earth and beyond our universe that brings harmony. Being is about being alive with one another. It is a powerful idea to bring well-being together as the framework in our work of HOME. It is profound. I believe it is Providential that we seek the sacredness of well-being in the collaboration work of HOME> Well-being is the work in seeking harmony, day to day a calling and a challenge. I need others to support the journey. We need each other. Providence Associate Jude Magers is retired after 45 years in Catholic health care with experience in oncology and hospice nursing practice, nursing administration, organizational development, mission integration and medical ethics. She holds Master Degrees in Nursing Administration and Pastoral Theology. Thanks Jude for sharing your insights and all you are and do for the Sisters of Providence. I’m happy you are a Providence Associate too. We are enriched by your presence among us. Whenever I see a photo of a group of Sisters, I always look for the ones I know. There she is!! Sister Agnes Maureen, right in front of me. I am especially thankful for her, since we have been corresponding for over 50 years! But I am also grateful for Sisters Marian Brady, Mary Madden, Marceline Maddingly, Mary Griffin. Blessings to all! Part of my well-being is the occasional glimpse of the women who helped shape my life. I &ave already read it more than once. There is so much to savor. Thank you for the great gift you are in a world so in need of what you have to offer. You are such a blessing! thank you for these meaningful insights! Wow! You’ve done it again with clear, meaningful and thoughtful insights and truths. Thank you. Three elements of your reflection touched me, Jude. The truth that I am well simply because of “being always alive in the Divine Mystery; the reality of community: oneness with all, even “insects”; and related to community, the need for one another “on the journey.” As others have noted before me, you have provided much material for pondering and for living. Thank you! Jude, a wonderful way to think about and pray about and live out of “well being.” Thanks! So lovely, thank you Jude for your wisdom! Very well said, Jude. Thank you for sharing!